A ruling on the incident by racing officials is expected by Sunday or Monday. 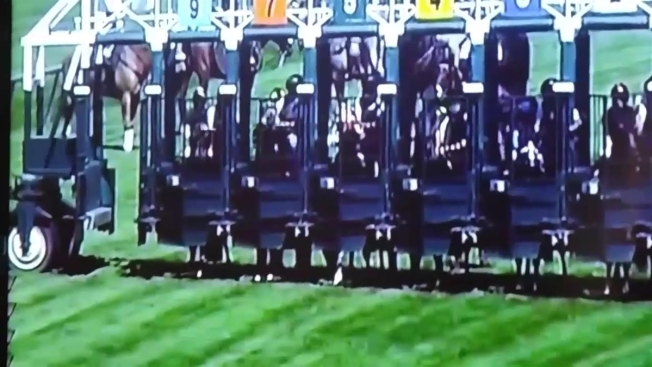 A worker who handled horses at a Delaware Racetrack was suspended Thursday after video surfaced showing him punching a horse multiple times in the head. An administrative hearing was scheduled for Saturday to decide what to do about the worker at Delaware Park in Wilmington, according to the state Thoroughbred Racing Commission. He has not been identified, but a track official said he is an assistant handler. At the time of the punching, the handler was in the starting gate with the horse, whose name is Accolade. The incident occurred moments before the start of the fifth race of the day at the track. Accolade went on to finish sixth out of seven horses, beating only another horse named Trust the Process. "Delaware Park in no way condones the mistreatment of animals and immediately suspended the assistant starter involved in an incident before the 5th race yesterday at the racetrack," track official Chris Sobocinski said in an email. "The incident has been referred to the Delaware Thoroughbred Racing Commission, which will investigate." The commission said in a statement that the hearing Saturday will be followed by a ruling announced Sunday or Monday.